This is a recipe that is prepared throughout Latin America and around other places in the world. As it can be expected each country has its own preparation style and we are going to concentrate in the Mexican version of the picadillo . The Mexican pork picadillo consists of ground pork meat, that is mixed with various vegetables and it is cooked in a kind of tomato salsa. It is a dish full of flavor and full of color. This dish is very versatile as it can be served as appetizer and if it is accompanied with tortillas delicious picadillo tacos can be made or also the picadillo can be put over tostadas. – The other option is to serve it as main course and as garnish white rice , guacamole , beans or salad can be put. The picadillo preparation is a bit laborious... but you will like the recipe. The picadillo is prepared with 1 serrano pepper however if it is too spicy for you, just use the half. This recipe is very versatile and you could also use green beans, zucchinis, corn, etc. Finely chop 1/4 of an onion (1.2 oz) and 1 serrano pepper, then reserve. It is always better to use the carrot peeled. Incorporate in the saucepan the serrano pepper that was minced and fry it for about 30 seconds, until the chili is a little soft; stir regularly. Add in the saucepan 14.1 oz of ground pork meat and fry it for about 4 minutes, until it is moderately cooked and it turns to a white color; stir regularly. The Potato dices that were cut. The Carrot dices that were cut. Mix all the saucepan ingredients. When the salsa boils reduce to low heat and cook the pork picadillo for about 15 minutes, until the pork is well cooked and the salsa has almost totally consumed; stir occasionally. 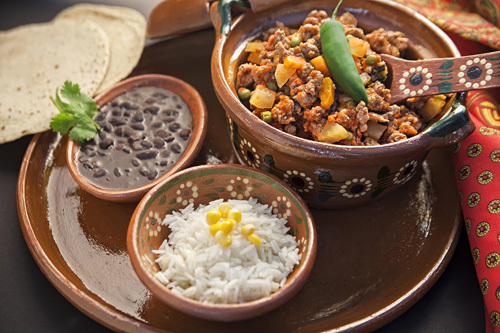 Variation: The picadillo can also be prepared with beef and it is very popular among the Mexican families. Did you like the Picadillo? Serve the picadillo on a beautiful Mexican plate. Place these shakers on your table to make it look very Mexican. Put on your table a Mexican tablecloth full of color to fill your meals with joy.